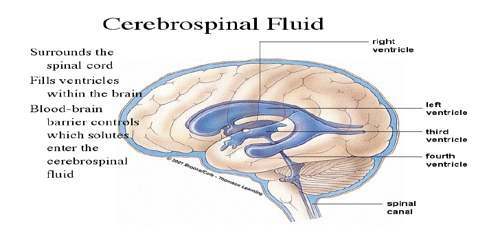 Cerebrospinal fluid (CSF) is the clear fluid that fills the cavities of the brain and covers the surfaces of the brain and spinal cord. It lubricates the tissues and cushions them from shock and injury. CSF is produced by the choroid plexus, a series of infolded blood vessels that project into the cerebral ventricles, and it is absorbed into the venous system. If production exceeds absorption, CSF pressure rises, and the result is hydrocephalus. There is also a connection from the subarachnoid space to the bony labyrinth of the inner ear via the perilymphatic duct where the perilymph is continuous with the cerebrospinal fluid. CSF can also occur if the CSF pathways are obstructed, causing the fluid to accumulate. The CSF obtained during a lumbar puncture is analyzed to detect disease. As the colorless fluid goes around our brain and spinal cord, it cushions those organs, picks up needed supplies from our blood, and gets rid of waste products from brain cells. Sometimes cerebrospinal fluid can have things in it that shouldn’t be there, like bacteria or viruses that can attack our brain. 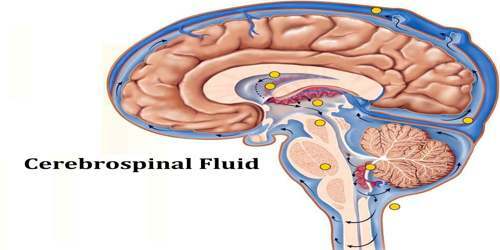 Cerebrospinal fluid is the liquid around our brain and spinal cord. The dual outflow systems for the egress of CSF from the intracranial CSF compartment control the balance between CSF production and drainage that ultimately impacts the constancy of the cerebral environment. CSF is slightly alkaline and is about 99 percent water. There are about 100 to 150 ml of CSF in the normal adult human body. This CSF circulates within the ventricular system of the brain. The ventricles are a series of cavities filled with CSF. 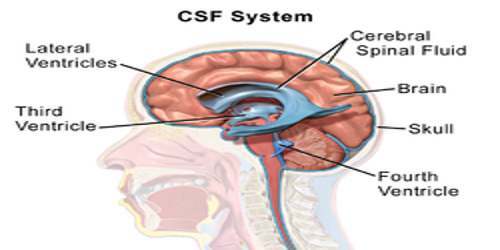 The majority of CSF is produced from within the two lateral ventricles. The CSF is derived from blood plasma and is largely similar to it, except that CSF is nearly protein-free compared with plasma and has some different electrolyte levels. It contains approximately 0.3% plasma proteins, or approximately 15 to 40 mg/dL, depending on sampling site. Formed primarily in the ventricles of the brain, the cerebrospinal fluid supports the brain and provides lubrication between surrounding bones and the brain and spinal cord. When an individual suffers a head injury, the fluid acts as a cushion, dulling the force by distributing its impact. The fluid helps to maintain pressure within the cranium at a constant level. An increase in the volume of blood or brain tissue results in a corresponding decrease in the fluid. The CSF is continually produced, and all of it is replaced every six to eight hours. The fluid is eventually absorbed into the veins; it leaves the cerebrospinal spaces in a variety of locations, including spaces around the spinal roots and the cranial nerves.